She was beautiful right out of the box. We ordered this beauty from SureMarineService.com on September 2nd and it arrived on September 8th: an exceptional turn around. The grand total, including shipping, was $675.71 for almost everything we needed for installation. This was the best price we found, and we did our research. One thing I did take issue with though, was that the stove was shipped with the ash tray in it, which caused serious scuffing on the front of the stove (most of which is covered by the tray itself, or I would have sent it back). Other than that, we’re happy with our experience shopping with them. 2 feet of 1/2″ Quadrafire Ceramic Insulation Blanket (to protect the cabinet and ceiling/roof) If you can’t find this locally, it is available on Amazon as well. The first thing we did after the stove arrived, was pull everything out of the box and make sure we had all the parts we needed. We found that the steel backplate did not come pre-drilled with holes for the stove to be attached to it (which makes sense- that way you can choose where you would like to place the stove along the backplate). The manufacturer recommends a clearance of 8 inches on all sides (except the back) of the stove. For us, this split the difference between the desk/breakfast bar and the upper cabinet we were installing it between. Because a good amount of the heat emanates from the hot stove pipe, we chose to bump the back plate all the way up to the bottom of the cabinet behind the pipe, which very nicely placed the bottom of the stove in alignment with the bottom of the plate. After holes were drilled to attach the stove to the plate, we brought the newly attached stove and backplate into the trailer and decided on placement, marking out the places to drill pilot holes for the screws with a pencil. There are no pictures of that part, because ALL of our energy went into not killing each other during what turned out to be a very trying ordeal. After the holes were marked, the stove and backplate were disconnected from each other, and that lovely white protective film removed. Then the two were reattached. 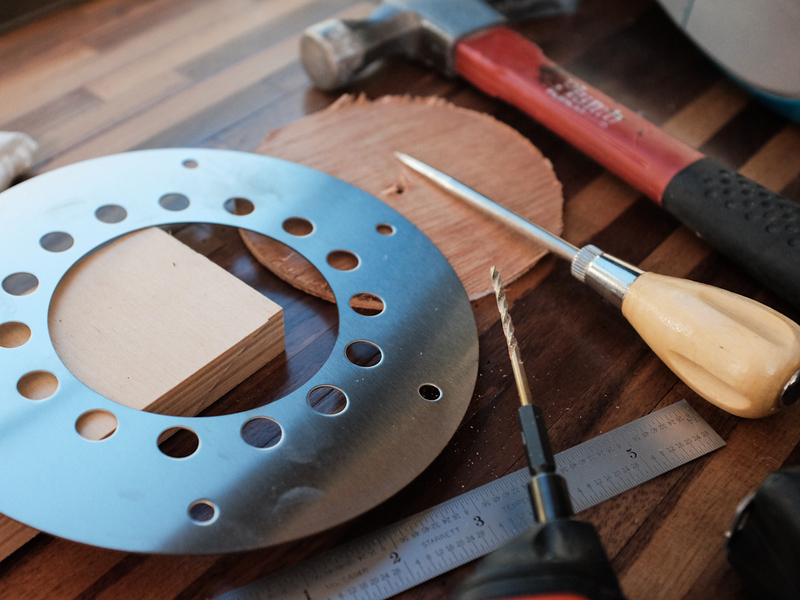 The pilot holes were drilled through the thin wall that divides our living space and bathroom, and the stove and backplate were installed with 1 1/2″ screws, large washers for reinforcement, and nylon lock nuts. Our bathroom is still awaiting redesign. Once we’ve committed to a design, we’ll work around these. Washer, nylon lock nut and the end of the screw. Once the stove and backplate were installed, we had a permanent location for the chimney pipe and started laying out our cuts from the bottom up. Using a plumb bob and two steel rules, we found the center of the stove pipe connection. From there we drilled a pilot hole (lots of pilot holes in this install) up through the bottom of the cabinet, using the mark we made as a reference. 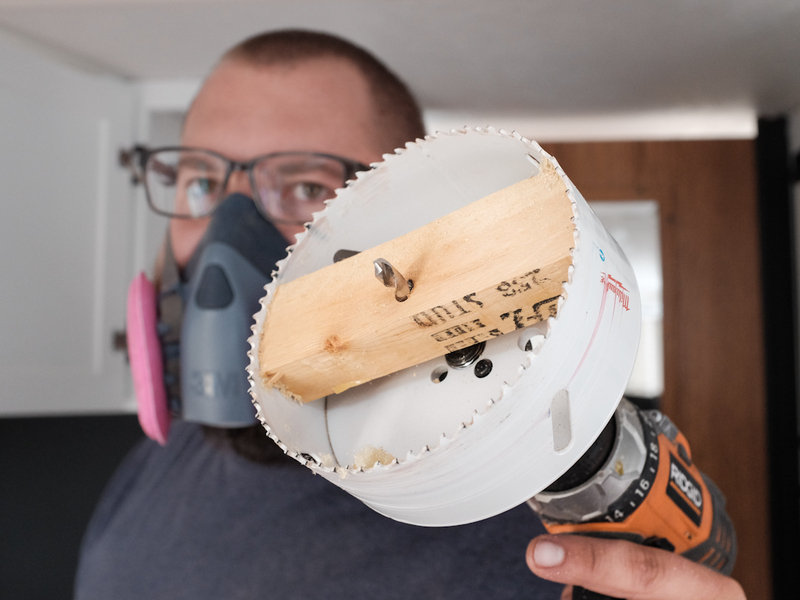 Once the pilot holes were done, we used the 5″ hole saw, and starting again from the bottom up, we drilled through the bottom of the cabinet to make our first stove pipe hole. Then we started the hole in the ceiling from underneath, sawing about halfway through. The hubs climbed up on the roof to finish the hole, drilling down from the roof through to the hole started from the bottom, right through the air conditioning vent. Whoops! Fortunately, the vent is just made of lightweight foam, and we were able to patch it (out of the way of the stove pipe) with pieces we had removed from it with the saw. Good as new! Making room through the roof to install the stove pipe. Here I am, standing on the top of a stool, perched on top of the steps so I can get shots of the top of the trailer. I lived. Obviously. After the holes were finished, and the AC vent repaired, we cut strips from the ceramic thermal insulating blanket and wrapped them around the edges of the holes we made to protect them from the heat coming off the 3″stove pipe that would be running through them. We then fit the pipe, taking measurements to determine the sizes we need. Hubs took a grinder to the pipes, cutting them to size. Insulation around the hole in the top of the cabinet, and roof where the stove pipe will pass through. more insulation around the hole in the bottom of the cabinet, where the stove pipe will pass through. Never get between a boy and his grinder. No… really. Do you see that sh*t? Once our different pieces of pipe were cut to size, we began installing them. 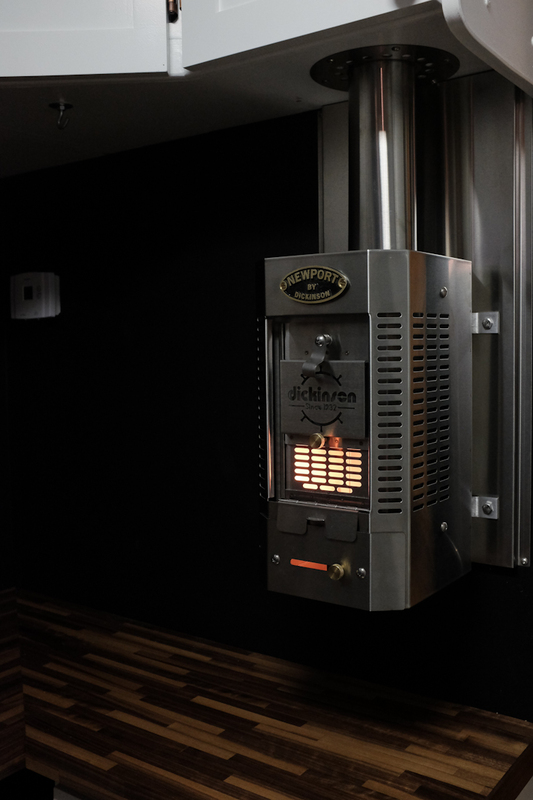 We removed the protective film from the 3″ stainless steel stove pipe and tension fit it to the oblong flue collar on the top of the stove by squeezing it into an oval shape and slipping it over the collar. At this point, we realized we hadn’t installed the dress rings, so we took it back apart and did so. We also cut the double walled pipe we were using in the cabinet to keep it from overheating. We scraped the crap out of the cabinet installing it, because nothing ever wants to fit into the space you want to put it in. Can I get an amen? We next fed the 3″ pipe through the holes in the dress rings and up through the double walled pipe to the roof. Hubs climbed up top again and fit the deck iron and gasket onto the pipe, securing it to the roof with stainless steel screws. 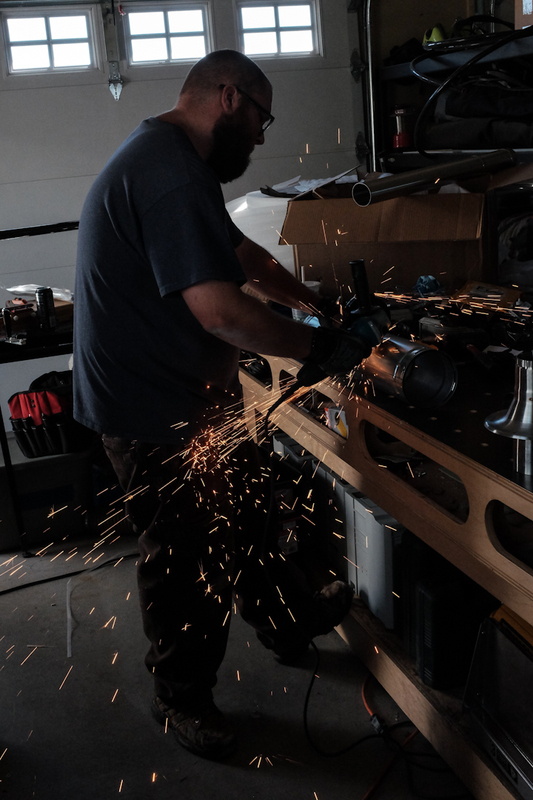 The initial plan was to install the H Cap straight onto the the deck iron, but we wanted to give it more clearance, so we took what was left of our 3″ pipe after cutting it to size (about 15-16″) and attached it to the deck iron, then attached the H Cap to that. The stove pipe is tension fit over the oblong flue collar on top of the stove. The double walled pipe is cut to fit, and floating around the 3″ stove pipe inside, protecting the cabinet from overheating. At this point, we tested the stove, making sure there were no issues with the insulation and that everything was working smoothly. What a beautiful sight she was, dark and moody, and all aglow in the firelight. We intentionally chose a block of clear weather so as not to have issues with water damage. We have a couple more test runs planned, and then we’ll pull some of the construction apart- just to check the inside of the walls and cabinet to make sure everything looks good before we Dicor around the vent to seal out the moisture. What really excites us about this project (aside from the obvious aesthetic value of the stove) is that it is one more step towards our future farmstead. Once we’ve found the property we’re looking for, we’ll be living on it in the trailer for some time while the farmstead is under construction, at which point we expect to be entirely off-grid. 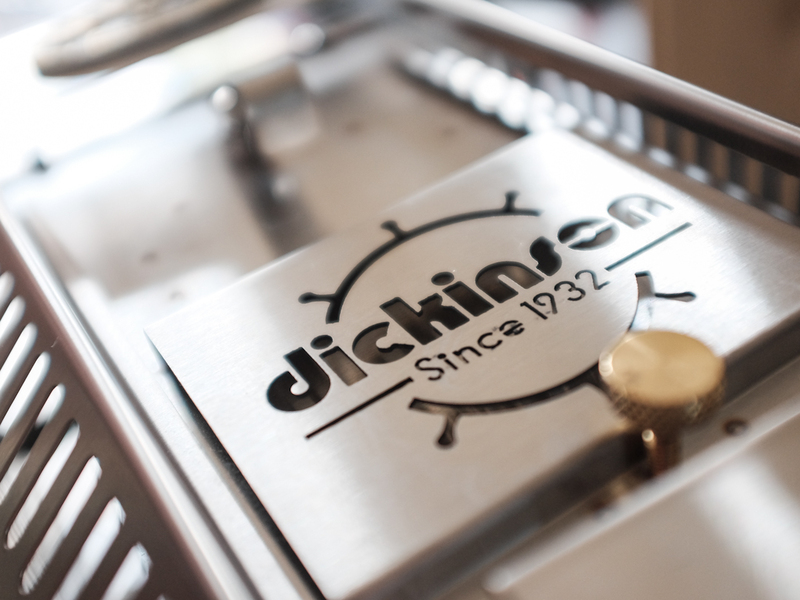 Having an efficient wood burning stove will be absolutely necessary if there’s a chance we won’t have any power during the winter, which would leave us unable to use our propane heater. Very exciting stuff indeed! Piggybacking this project will be another where we cover the (very, very old) Dicor Lap Sealant around the various objects on the roof, with fresh Lap Sealant, then clean and recover the roof with a product called Dicor CoolCoat Insulating Roof Coating. Just one more step towards winterizing the travel trailer. See post. After using the stove, we found the insulation we put inside the roof to be somewhat inadequate. (It melted the foam air conditioning ducting- whoops!) When we took everything apart, we found that when the ducting was originally installed, it wasn’t installed properly anyway, and was virtually collapsed in the bathroom (which you’ll recall, shares a wall with our new stove), releasing air into the open space between the ceiling and the roof, and basically none through the vent in the bathroom itself. Taking those circumstances into account, we decided to dead end the ducting at the AC vent before the stove, making the bathroom vent inoperable. As I mentioned, it wasn’t working anyway, just releasing air into the open space between the joists, and we don’t have the know-how (or desire) to tear apart the entire roof and fix it. Using insulating foam and duct tape, we blocked the duct work immediately after the last vent in the living space before it passes the stove, and using the hole we originally made in the ceiling and roof to install the stove pipe, we cut away the now useless foam vent from around the pipe. Problem solved! As an extra precaution, we decided to wrap the stove pipe (from where it runs through the bottom of the cabinet, to where it runs through the top of the roof) in what was left of the ceramic insulated blanket. We felt that the double walled stove pipe alone seemed to be releasing too much heat up into the roof space. It didn’t feel as though it would be in any danger of catching on fire, but we would rather be safe than sorry. We used metal hose clamps to secure the ceramic blanket around the stove pipe, and fed it back through the holes and reattached it to the stove. Due to the newly increased size of the pipe, it was necessary to remove both the dress ring from the ceiling and from the inside of the cabinet. Because the extra wrapping stopped at the bottom of the cabinet, it was not necessary to remove the bottom dress ring. Another addition we made, was to add a Thermotech Adhesive Backed Heat Barrier to the underside of the cabinet. This provides additional protection for the cabinet, as well as serving to direct some of the heat back down into the room. We left the double walled pipe off for accessibility while we’re still testing things out. Everything has been working out really well though, so if we do add it back into the mix, it will mostly be for looks.